The Bernstein Companies and its joint venture partner Boston Properties marked a significant milestone as it broke ground on the future Marriott International headquarters and Marriott Hotel in downtown Bethesda, Md. 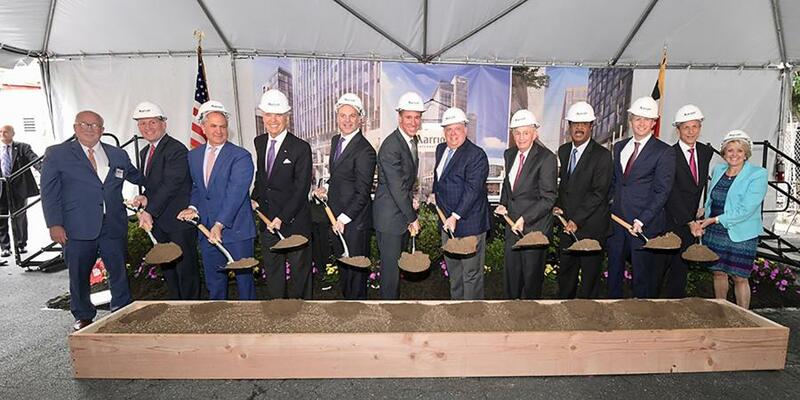 The Bernstein Companies and its joint venture partner Boston Properties marked a significant milestone June 21 as it broke ground on the future Marriott International headquarters and Marriott Hotel in downtown Bethesda, Md. J.W. Marriott Jr., executive chairman and chairman of the board of Marriott International, opened the ceremony by welcoming Maryland Gov. Larry Hogan, Montgomery County executive Isiah Leggett and other public and private dignitaries to celebrate the first phase of construction of the company's new headquarters. Arne Sorenson, Marriott International president and chief executive officer, pushed Marriott's move from its current suburban location to a walkable, transit-oriented environment. Sorenson said the headquarters office building will be a cutting-edge, sustainable, workplace offering modern technology and amenities, and easy access to a range of transportation options, including the Bethesda Metro Station less than two blocks away. With more than 785,000 sq. ft. of office space to support approximately 3,500 associates, the headquarters building is designed to LEED GOLD standards, allowing an abundance of natural light, while providing new opportunities for flexible, collaborative workspaces. The campus also will offer Marriott associates a childcare center, a fitness center and a cafeteria. In addition to the headquarters building, the location will be home to a new Marriott Hotel, a 244-key, full-service property with more than 8,000 sq. ft. of meeting and ballroom space. The hotel will offer guests and the public access to a coffee shop, a roof-top bar and lounge and a contemporary neighborhood restaurant serving breakfast, lunch and dinner with the option of outdoor dining on a pedestrian plaza. Hogan was joined at the celebratory event by other state and local officials, including Leggett, who led the local effort to keep Marriott in Montgomery County. The Bernstein Companies and Boston Properties own the land and will jointly develop and own the Marriott International headquarters office building while The Bernstein Companies will build and own the adjacent hotel. Marriott will manage both the office building and the hotel. In December 2017, the developers received formal approval of the sketch, preliminary and site plans from the Montgomery County Planning Board. Demolition was expected to begin in June 2018 and construction is scheduled to begin in July. In early 2022, the Marriott Hotel will open and Marriott International associates will move into their new headquarters office building by mid-2022. As of 2017, Marriott International supported more than 10,000 jobs throughout Maryland, and approximately 6,100 in Montgomery County alone, making the company one of the county's largest private employers. According to an economic report, the project will have a considerable impact on Maryland's economy, including $89 million in construction salaries over the next few years, $2.3 billion in business activities in its first year of operation, and up to $1.8 billion provided for local taxing districts over the next 20 years. In honor of Marriott's history, the company and the development team provided invited guests with commemorative root beer mugs filled with root beer. The company's roots date back to 1927, when founders J. Willard Marriott and his wife, Alice, opened a small, nine-stool A&W Root Beer stand in Washington, D.C., which eventually became the Hot Shoppes restaurants enterprise, a public company in 1953 that grew to 56 restaurants. Marriott wouldn't make its historic entry into the hotel business until 1957. Since then, Marriott International has called Montgomery County home for more than 60 years and has resided in its current location on Fernwood Road since 1979. In that time, the company has grown exponentially and, with its acquisition of Starwood Hotels & Resorts in September 2016, Marriott's portfolio now includes 30 brands, with more than 6,500 properties located in 127 countries and territories, with more than 700,000 people wearing the Marriott badge around the world. For more information, visit www.thebernsteincompanies.com, www.bostonproperties.com and www.marriott.com.